The success of Nuits Saint-Pierre is due to its special atmosphere. Neither casual nor formal, our team creates an atmosphere that is both friendly and reserved. Just listening and serving our customers. Together with my husband Bertrand, I am the owner of this large, beautiful house. Your first contact with Nuits Saint-Pierre is with me: I take your reservations, I welcome you at the airport and I show you the hotel and your room on arrival. 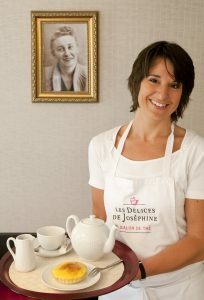 I also prepare the wonderful cakes you’ll find at our Tea Room, Josephine Delights. They make a wonderful smell that hangs in the air. In 1939 a huge fire destroyed a third of the town of St-Pierre. Joséphine and Georges Pannier’s house was burnt to the ground – a house they had owned for only a few months. They lost everything. However, with great courage and determination, they decided to rebuild on the ruins. This time, they did not use wood as building material but bricks and soon a bright and spacious house was built where their first home once stood. The building location, right downtown, was ideal to open a business. On the first floor, they set up what will become the very popular « Magasin Général Pannier – Gros et Détail » (Pannier General Store – Wholesale and Retail). The second and third floors were used for the family residence. Georges managed the wholesale business and also a Renault dealership. Joséphine was in charge of the retail store. She had exquisite taste and chose to sell products from brand names which are still flourishing today: Petit Bateau, Antinéa, Christofle, etc. Very soon, the Maison Pannier became a prosperous business that would last for many years. 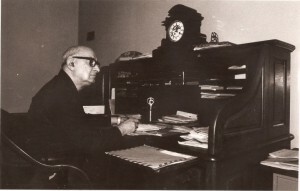 In 1982, Georges passed away and Joséphine stayed alone in the big house. In 1991, she moved to the old age home where she died at the age of 103. She is remembered as an extraordinary person and an honorable business woman.